Can God turn your failures into a current ministry? The Bible seems to show this to be true. I truly believe that some ministries are birthed out of pain. 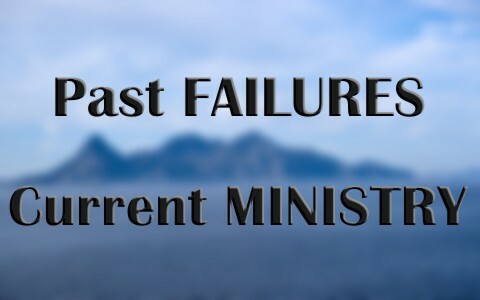 Your greatest failures can often give rise to your greatest ministries. I know of a former prisoner who is now our associate pastor and he has turned his failure into one of his greatest ministries; writing letters to prisoners. He can identify with what they’re going through because he’s been through it himself. Who would better understand what prisoners are going through than one who was a former prisoner himself? What seemed like a huge failure for him turned into a powerful ministry for the Lord. God used this man’s past failures and shaped them into a way to share the gospel of Christ with those behind prison walls and by doing so, he is obeying the commission given by Christ in Matthew 25 which says “I was hungry and you gave me something to eat, I was thirsty and you gave me something to drink, I was a stranger and you invited me in, I needed clothes and you clothed me, I was sick and you looked after me, I was in prison and you came to visit me” (Matt 25:35-36). In this man’s case, he is visiting those in prison, if only by letter but even so, Jesus says that “whatever you did for one of the least of these brothers and sisters of mine, you did for me” (Matt 25:40). Paul knew a lot about failure and suffering and that part of the reason for our suffering was that God “who comforts us in all our affliction, so that we may be able to comfort those who are in any affliction, with the comfort with which we ourselves are comforted by God” (2 Cor 1:4) “For as we share abundantly in Christ’s sufferings, so through Christ we share abundantly in comfort too” (2 Cor 1:5). If we are suffering right now from a failure, quite possibly God wants us to comfort those who are also suffering and with the same kind of comfort that God provides us, we can provide for others. Much like our associate pastor who I mentioned in the opening paragraph, God used his sufferings to help comfort those still in prison. This man can truly say “I understand what that feels like” and so the prisoners he ministers too know that he does understand what it’s like and can give comfort to those who are in the place where he was at one time. If you have failed at something then you probably learned why it failed and by this experience, you already know what works and what doesn’t. Often, what doesn’t work is doing things to be seen by men. Rarely does that ever work but when we do things for the glory of God, then knowing that this is always God’s will, the chances for a successful ministry are greatly increased. Failure teaches us, “Don’t do it that way again” but rather “Let’s do it this way.” We’d never know half of what we know today unless we had learned from our failures in the past. Failure is one of the best teachers there are in life and learning from failure can help us avoid a repeat performance. Did Jeremiah and Ezekiel Fail? God sent Jeremiah the Prophet to warn the nation of Judah about the coming judgment of God unless they repented and turned back to God but I find it very interesting that God told Jeremiah that they would not listen to him, saying; “So you shall speak all these words to them, but they will not listen to you. You shall call to them, but they will not answer you” (Jer 7:27) “Therefore do not pray for this people, or lift up a cry or prayer on their behalf, for I will not listen when they call to me in the time of their trouble” (Jer 11:14). Looking at this from a human perspective, it would appear that Jeremiah was set up for failure but God saw Jeremiah’s ministry as a success. Even though Jeremiah was constantly hounded and one time was thrown into a deep well, apparently left to die, he was successful from God’s viewpoint and that’s all that matters. It wasn’t failure to God. God used Jeremiah’s ministry successfully, regardless of the outcome, so as long as we are doing what we’re commanded to do, it isn’t failure; even if it looks like it. The response of the people is not a determining factor as to whether a ministry is successful or not as even Ezekiel was told “You must speak my words to them, whether they listen or fail to listen, for they are rebellious” (Ezk 2:7). Did Jeremiah and Ezekiel fail? No because as long as you obey God and even if it looks like failure, obedience to God is never a failure and doesn’t depend on a human response or lack thereof. If you stopped in the gospels at the point where Peter denied Jesus three times, it would seem that Peter was a total failure but God restored Peter and he was used powerfully by God and gave one of the greatest sermons in the Bible in Acts chapter two (2:14-41). The lesson here is when we fail, and we all do at one time or another, God can restore us after we’ve repented and been forgiven. We can move forward and not look backward at our failures because God allows even bad things that happen to us to work for our best and highest good (Rom 8:28). God turned Peter’s huge failure in his denial of Christ into a huge benefit where Peter was used mightily by God to preach the gospel and point many souls to their need for the Savior and as a result of Peter’s first great sermon, they “received his word were baptized, and there were added that day about three thousand souls” (Acts 2:41). Don’t let failure discourage you and stop you in your tracks. Use failure to your advantage and turn it into a ministry. God cannot use a man or woman greatly until He has first hurt them deeply. Our pain can be our platform. Our hurts can be our help. Our failure can be our future success. God can use your greatest pain as your greatest launching point for a ministry; God can use your failures to comfort others; God can use failures to show us what works and what doesn’t; God can use the failure of a response from others; and God can use our failures to be used even more powerfully by God. Thank you for your kind words. Truly all glory goes to God. Yes. Very encouraging message. It is so difficult to fail at anything. How great to know that even one’s failure can be turned to usefulness for the glory of God. Amen Carmen. I had much experience with failure. “I truly believe that some ministries are birthed out of pain.” This is a quote worth tweeting. 🙂 As I navigate my post-divorce/co-parenting life, I know how very true this is. The depth of despair, fear, anger, hopelessness and loneliness I’ve felt as a result of my divorce initially paralyzed me but then the Lord began dealing with me. He gave me His Word and hope. Then He gave me community and placed in me in a loving community of believers through my church. I began counseling and I had to make a choice to forgive my ex-husband. I had to forgive myself and I had to repent of the sin lifestyle I engaged in which led to an ungodly union in the first place. I’ve been divorced 3 years now and it’s not easy particularly because I have to co-parent but God in His awesomeness is turning things around for His honor and glory. I began a twitter account called healfromdivorce and I love providing biblical truths which help people heal from hurts and hang-ups. I’m not a seminary student nor a lay pastor…I’m just a girl from NYC who loves Jesus and wants to share what He’s doing for me. How He is turning my pain to purpose for His glory. What a powerful testimony my sister in Christ. How encouraging! Praise God and I thank God for women of faith like you who persevere in the dark nights of the soul, the shadowy valleys, and still turn that pain for God’s glory to be displayed. Thank you my fellow heir in Christ. Thank you for your message from God it really hits home ,but with different situations in my life . Meant a lot to me . I look back a lot and see how all the bad I’ve been through God has used it in his will for me in his plans . I’ve grown up wonderful with God and still want to see what he sees & use my hands as his to do his work . Previous post: What Does The Bible Say About Arrogance?